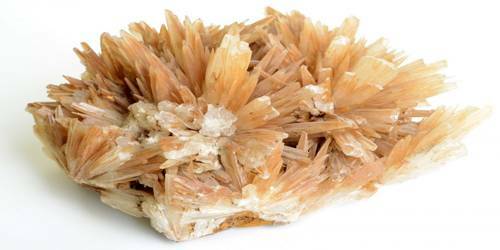 Aragonite is a carbonate mineral, one of the two most common, naturally occurring, crystal forms of calcium carbonate, CaCO3 (the other forms being the minerals calcite and vaterite). Calcium carbonate forms as both Aragonite and Calcite, and these two minerals only differ in their crystallization. This carbonate gemstone is usually colorless or white in color. It is formed by biological and physical processes, including precipitation from marine and freshwater environments. It is the main component of many organic substances, such as pearl and coral. It was named by Abrahan Gottlieb Werner after Molina de Aragón, Spain, the type locality where this mineral was first described. 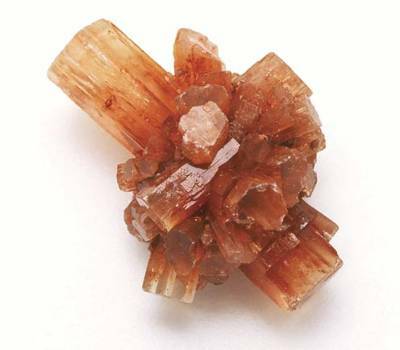 Aragonite’s crystal lattice differs from that of calcite, resulting in a different crystal shape, an orthorhombic crystal system with acicular crystal. Repeated twinning results in pseudo-hexagonal forms. It is thermodynamically unstable at standard temperature and pressure and tends to alter to calcite on scales of 107 to 108 years. The mineral vaterite, also known as μ-CaCO3, is another phase of calcium carbonate that is metastable at ambient conditions typical of Earth’s surface and decomposes even more readily than aragonite. The type location for aragonite is Molina de Aragón (Guadalajara, Spain), 25 km from Aragon for which it was named in 1797. An aragonite cave, the Ochtinská Aragonite Cave, is situated in Slovakia. In the US, aragonite in the form of stalactites and “cave flowers” (anthodite) is known from Carlsbad Caverns and other caves. Massive deposits of oolitic aragonite sand are found on the seabed in the Bahamas. It is the high-pressure polymorph of calcium carbonate. As such, it occurs in high-pressure metamorphic rocks such as those formed at subduction zones. In aquaria, aragonite is considered essential for the replication of reef conditions. It provides the materials necessary for much sea life and also keeps the pH of the water close to its natural level, to prevent the dissolution of biogenic calcium carbonate. It has been successfully tested for the removal of pollutants like zinc, cobalt, and lead from contaminated wastewaters.